Sawyerr/Peters Removals prides ourselves with offering professional house moves and secure storage facilities. Our origins can be traced back to 1974, with our quality removals service earning a great reputation in and around the Warwickshire area. "Sawyerr Peters have been established since 1974"
At Sawyerr/Peters Removals we pride ourselves on high quality customer satisfaction. Whether you’re keeping it local or nationwide, we have the specialised and high quality removals service for you, taking away the stress in home moving. Our complete removals service covers everything right from your initial free removals quotation through to any move-related services that you require for your new home/location. At Sawyerr/Peters we offer a complete, professional service to pack the entire contents of your home or a part packing service, for example: china/glassware only. We can provide or obtain any materials of your choice, which can be purchased from our office in Warwickshire, whether you prefer to pack yourself, or even if you are not moving with us. We offer safe and secure storage facilities at our on-site CCTV monitored premises in Warwickshire. With a choice of Container or Bay storage, and short or long term storage, we have the facilities to suit your requirements. If you wish to view our storage facilities, we would be happy to accept requests for viewings. We operate throughout Warwickshire, Oxfordshire, Northamptonshire, West Midlands and beyond, local areas include Alcester, Banbury, Birmingham, Coventry, Daventry, Leamington Spa, Leicester, Kenilworth, Rugby, Southam, Stratford upon Avon and Warwick to name but a few. Also helping our clients move to the Channel Islands, Ireland, Isle of Man, Northern Ireland, Scotland, Wales and to the capital, London. Please call us today on 01926 337 735 to see how our Removal Service can help you. Why Choose Sawyerr/Peters Removals for your removal and storage needs? Long drive up to the North West of Scotland, a beautiful location to do a removal job for a client. Moving house: A large stately home. The most recent development with this company that we were involved in was in Leicester and was an apartment block ripe for redevelopment. For more on this great removal job. A large house removal recently where we needed 3 large trucks to get the job done. All hands on deck for this one! Travelled down to help with a removal at a beautiful large home in South Petherton, a small village in south Somerset. We had the privilege recently of helping one of our clients move home from this beautiful property in Princethorpe. To read more about what our customers are saying about our removal services then please go to our testimonial page. Leicester Star Jamie Vardy on the Move! Jamie Vardy, the Leicester and England star has been on the hunt for a new house with his pregnant wife after the peace and quiet was continually disturbed late into night at their home in Melton Mowbray. Member of Parliament for Warwick and Leamington Chris White had appealed to the Secretary of State to reconsider his decision about the project to build over 1300 homes in the Warwick area. Moving home can be one of the most stressful events that can occur to the average person throughout their life, it ranks up there with job loss and divorce. It pays to get organised and a checklist of what needs to be done can come in handy for any size of move. We are looking for bright and energetic staff to join our team, if you would like to know more please see our recruitment page. 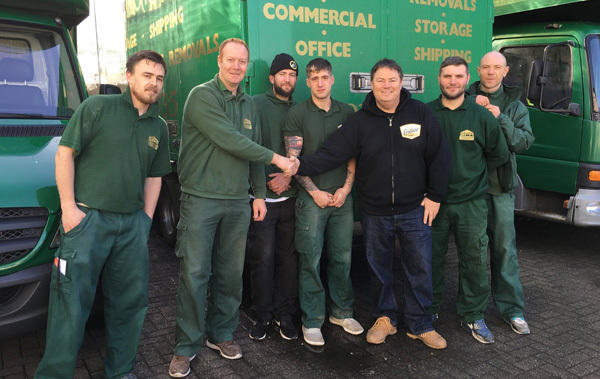 “We would highly recommend Sawyerr/Peters Removals for both packing and removals. They took the stress out of moving house for us! The packing service was excellent – everything handled with great care and labelled really well so that we could find things easily the other end! Just a few lines to say thank you for all your help moving my furniture to Nice in the South of France. A very polite and professional team collected and more importantly delivered and unloaded in Nice on time and with no damage.